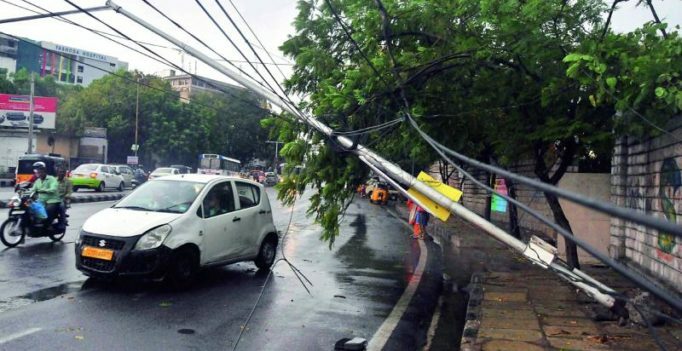 Hyderabad: Rain and thunderstorm continue to create havoc in Telangana. 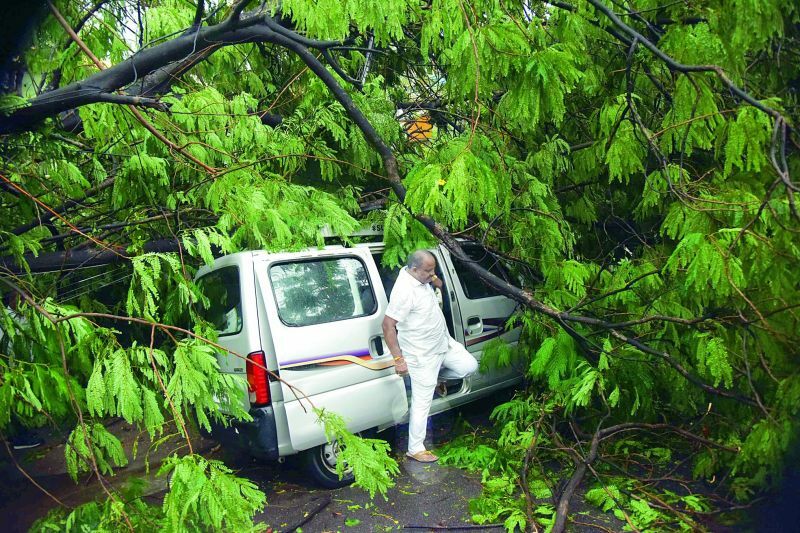 Flash rains in particular brought the city of Hyderabad to a grinding halt by late-afternoon and left a trail of disaster on its streets, killing two persons, felling 129 trees, and razing to the ground two whole houses besides knocking down 19 electric poles and 4 compound walls. The city plunged into darkness as 75 localities were blacked out due to the electricity cut. 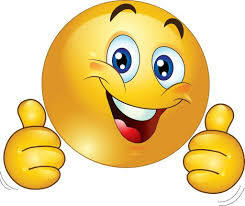 Even late evening, electricity had not been restored in many places. Two brothers, Mohd Kasim Ali, 45, and Mohd Anwar Ali, both street vendors had a stall on Afzal Jung main road footpath. With the heavy rains, the water seeped into the ground near an electric pole. Mohd Kasim Ali came into contact with an electric livewire, was electrocuted and died on the spot. His younger brother Mohd Anwar Ali also suffered an electric shock and has been admitted to Osmania General Hospital. Meanwhile, an unidentified body was found washed away along the stream at Kala Patthar, Makka Colony, Faluknama. The situation worsened when amidst heavy rain, a fire broke out at Mahavir building, near Hyderabad Police Commissionerate office, Basheerbagh. At Rajendranagar circle, Suleman Nagar, a compound wall collapsed on a house, injuring a resident. While at Moula Ali, the gusty winds pushed down solar panels which came crashing down on a car. Crucial stagnation points were reported at Malakpet, Santhoshnagar, Chandrayan Gutta, Falaknuma, Rajendranagar. At the entrance of Ambedkar University, a huge pit had been dug up for 1 lane elevated corridor. However, due to heavy rain; the pit had filled up making it dangerous for the oncoming traffic. The road was blocked and the traffic was then diverted from traffic police station of Jubilee Hills. This increased the traffic load on other roads. Authorities said the pit will be filled on Friday with sand. The diversion will stay in place for the next two days. Surprisingly the day started on a hot note with mercury touching 40.2 °. But at around 4 pm, sudden loud claps of thunder, accompanied with very heavy rainfall and winds with a speed of 70 kmph lashed the city and changed its landscape within minutes. The weather bureau has issued a thunderstorm warning for May 18, for the state. A thunderstorm accompanied with gusty winds likely to occur at isolated places in the districts of Sanga Reddy, Vikarabad, Ranga Reddy, Hyderabad, Mahabubnagar, Jogulamba, Gadwal, Wanaparthy, Nagarkurnool, Suryapet, Khammam, Medak, Bhadradri Kothagudem, Jagityal and Peddapalli. Mercedes sofa Imagine not having to get rid of your old car but giving it a new lease of life and actually bringing it indoors….